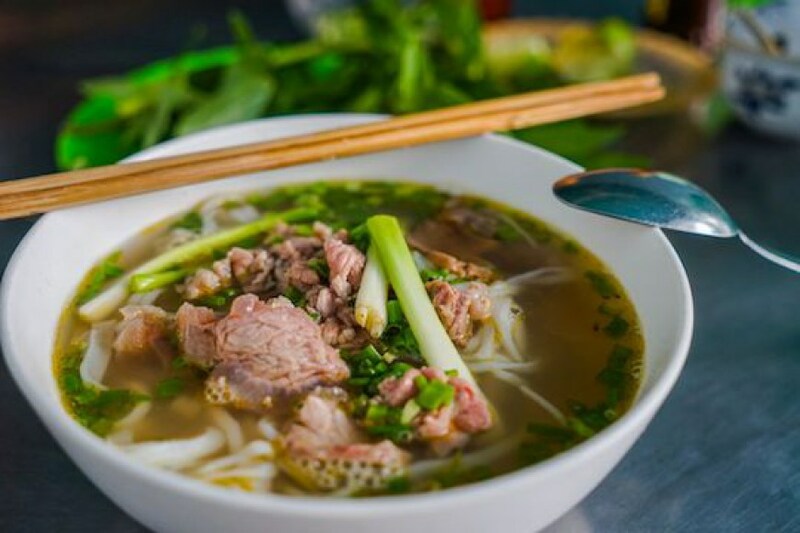 While many Asian cultures have signature soups, like Japan’s miso or ramen or Thailand’s tom yam kung, Vietnamese pho is praised for its simplicity and full-bodied broth, making it great to eat any time of day. While the first known references to pho appear in the late 19th century, there’s some controversy as to its origin. Some say it may have originated from the Cantonese “phan”, a broad noodle soup sold by Chinese immigrants on the streets of Hanoi, or as a Vietnamized version of the French “pot-au-feu” stew. However it got its start, though, pho boils down to a rich, fragrant broth made from simmering beef or chicken bones for hours, flavored with star anise, cinnamon bark and char-roasted onions and ginger. Chicken pho is made with chicken bones leading to a lighter, clearer broth.Beef pho, however, is by far the most common, and you can specify what you want in it: Raw sliced beef that’s cooked in seconds when it meets the piping hot broth, cooked brisket, meatballs, tripe, flank, fatty brisket, tendon or “đặc biệt” (pronounced: duk-beeyet) with the works. If you’re not a terribly adventurous eater, might we suggest ordering tái chín (pronounced: tie cheen) with raw slices of round steak and well-done brisket, which makes for a familiar yet delicious combination. Secondly, pho restaurants in Vietnam will likely indicate what style of pho they serve. Signs that say either “Phở Hà Nội” or “Phở Bắc” means the pho is Northern-style with a clearer broth, more MSG, fewer fresh herbs, and thinner noodles, as opposed to Saigon-style pho which is slightly sweeter and grittier. Tweak the taste with condiments found on the table including sweet hoisin (black bean) sauce, black pepper, lime, fish sauce, chili sauce (although very unlikely to be Sriracha) or fresh chili. Fresh herbs include (pictured here, left to right) rice paddy herb, sawtooth coriander, and basil, as well as bean sprouts (often blanched) and the white part of scallions. If you haven’t had them before, sample a bit of the herbs before you detach the leaves (discard the chewy stems) and add them to your bowl. The basil and sawtooth coriander are fragrant and relatively mild-tasting, while the rice paddy herb (with smaller leaves) is more pungent. In any case, they’ll taste milder once they’re submerged in the hot broth. Because of how long it takes to make a single pot of pho, most stalls will have either chicken or beef, not both. While pho restaurants are open all day, streetside pho is typically served in the morning where you can just pull up a low plastic stool and slurp away!